misteriozna stvorenja U PLANINAMA LUDILA! lavkraft je još pre 70 godina reko: oni su na južnom polu! evo sad i naučnici dokazuju: the starts are right! We are looking for new worlds on other planets, and we don't even know the worlds hosted by our own. A large array of giant mysterious creatures have been found by a recent two-month expedition in the freezing waters of Antarctica, including huge sea spiders and worms. 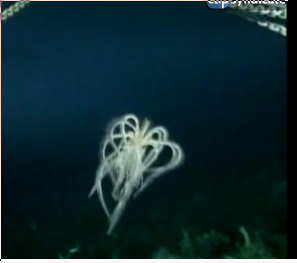 The new specimens have been found inhabiting the Antarctic sea bed at depths of up to 6,500 ft (2,000 m). Gigantism is a common phenomenon for many abyssal animals (giant squids up to 12 m (40 ft) long are just one example). "Gigantism is very common in Antarctic waters. We have collected huge worms, giant crustaceans, and sea spiders the size of dinner plates," said Martin Riddle, the Australian Antarctic Division scientist who led this international census of the Antarctic marine life. The samples are already being identified and DNA is investigated in many university centers worldwide. "Not all of the creatures that we found could be identified and it is very likely that some new species will be recorded as a result of these voyages," said Graham Hosie, head of the Collaborative East Antarctic Marine Census. The larger project is mapping fauna and flora in the Antarctic's Southern Ocean for assessing the impact of climate change on the Antarctic marine environment. 3 ships were involved in the recent expedition: Aurora Australis (Australia), L'Astrolabe (France), and Umitaka Maru (Japan). The work is part of an even larger project to map the biodiversity of the world's oceans. The French and Japanese ships investigated the mid- and upper-level environment, while Aurora Australis checked deeper waters with remote-controlled cameras. "In some places every inch of the sea floor is covered in life. In other places we can see deep scars and gouges where icebergs scour the sea floor as they pass by. Among the bizarre-looking creatures the scientists spotted were tunicates, plankton-eating animals that resemble slender glass structures up to a yard tall standing in fields like poppies," said Riddle. "They were all bottom dwellers so they were all evolved in different ways to live down on the seabed in the dark. So many of them had very large eyes—very strange-looking fish," added Riddle. Giant sea spiders: enough to give the screaming abdabs to arachnophobes the globe around. A recent scientific research vessel was trawling the deep waters around Antarctica and found, along with armoured shrimp, giant sea spiders that reach up to a foot across. Such a giant sea spider would make somthing of a show if it came up the plughole into your bath tub, don't you think? Fortunately they live in cold water an I always have hot baths....but still. Scientists studying Antarctic waters have filmed and captured giant sea creatures, like sea spiders the size of dinner plates and jellyfish with 6m tentacles. A fleet of three Antarctic marine research ships returned to Australia this week, ending a summer expedition to the Southern Ocean where they carried out a census of life in the icy ocean and on its floor, more than 1000m below the surface. "Gigantism is common in Antarctic waters - we have collected huge worms, giant crustaceans and sea spiders the size of dinner plates," Australian scientist Martin Riddle, voyage leader on the research ship Aurora Australis, said. The giant sea spiders, along with giant worms and crustaceans, are among up to 1500 species that Australian, Japanese and French scientists have brought back from the icy waters off Antarctica as part of a two-year census of marine life. With an Australian ship scouring the ocean floor and the French and Japanese searching for life in the mid and upper reaches, the scientists conducted a count of species known as the Collaborative East Antarctic Marine Census. Giant sea spiders, huge worms, fields of glass-like filter feeders and `flabbergasting' fish were among the ocean life recovered from the floor of the Southern Ocean by researchers aboard the Aurora Australis, voyage leader Martin Riddle said. So stunning was the wealth of discoveries, the ship's recent voyage south as part of the Collaborative East Antarctic Marine Census would go down as one of the great marine science voyages of all time, Dr Riddle said. Using trawls and underwater video photography, scientists had ventured as far as 2km below the surface. "We were amazed at what we found," Dr Riddle said. "We went there with certain expectations, but those expectations were far exceeded." "We saw giant worms, giant crustaceans, giant sea spiders, glass-like tunicates, enormously diverse areas in some places. Among the bizarre-looking creatures the scientists spotted were tunicates, plankton-eating animals that resemble slender glass structures up to a yard tall "standing in fields like poppies," Riddle said. "Gigantism is very common in Antarctic waters -- we have collected huge worms, giant crustaceans and sea spiders the size of dinner plates," Riddle added. Giant sea spiders and other species are among thousands of creatures—a quarter of them previously unknown—found in the icy depths of the Southern Ocean. SYDNEY, Australia - Scientists investigating the icy waters of Antarctica said Tuesday they have collected mysterious creatures including giant sea spiders and huge worms in the murky depths. "Gigantism is very common in Antarctic waters," Martin Riddle, the Australian Antarctic Division scientist who led the expedition, said in a statement. "We have collected huge worms, giant crustaceans and sea spiders the size of dinner plates." "Not all of the creatures that we found could be identified and it is very likely that some new species will be recorded as a result of these voyages," said Graham Hosie, head of the census project. Three ships — Aurora Australis from Australia, France's L'Astrolabe and Japan's Umitaka Maru — returned recently from two months in the region as part of the Collaborative East Antarctic Marine Census. The work is part of a larger project to map the biodiversity of the world's oceans. "In some places every inch of the sea floor is covered in life," Riddle said. "In other places we can see deep scars and gouges where icebergs scour the sea floor as they pass by." "They had fins in various places, they had funny dangly bits around their mouths," Riddle told reporters. "They were all bottom dwellers so they were all evolved in different ways to live down on the sea bed in the dark. So many of them had very large eyes — very strange looking fish." Scientists are planning a follow-up expedition in 10 to 15 years to examine the effects of climate changes on the region's environment. Ono što nama pokazuju deo je manjeg ugovora (lesser contract). Možda kosoki nabasaju na nešto za krkanje i možda Branson nađe nešto da naloži Virgin Air. U svakom slučaju, što rekla moja komšinica Obrena kad je bila mala: "Nosim tanjir!" A niko nije zeleo da slusa smerni poziv stanovitog profesora Dyer-a: Okanite se istrazivanja Antarktika...Sta vele, ima li shoggoth-a? Gledao sam snimak na Nation. Geograph. sajtu - baš su spooky. THE GREAT OLD ONES ARE AWAKING! The chunk of coastal ice was some 160 square miles (415 square kilometers) in area—about seven times the size of Manhattan. The shelf's rapid collapse began on February 28 (see image sequence at top right), sending a giant swath of broken ice into the sea—as seen in the bottom image, which shows a 2-mile-wide (3.2-kilometer-wide) area. "[It's] an event we don't get to see very often," Ted Scambos, lead scientist at the U.S. National Snow and Ice Data Center in Boulder, Colorado, said in a press statement. "The collapse underscores that the [Wilkins Ice Shelf] region has experienced an intense melt season. Regional sea ice has all but vanished, leaving the ice shelf exposed to the action of waves." David Vaughan of the British Antarctic Survey noted that the larger formation from which the chunk detached—the Wilkins Ice Shelf—could itself collapse in 15 years. "Wilkins is the largest ice shelf on West Antarctica yet to be threatened," Vaughan said in the statement. "This shelf is hanging by a thread." As summer in the Southern Hemisphere draws to a close, further disintegration of the shelf seems unlikely, Scambos added. "But come January, we'll be watching to see if the Wilkins continues to fall apart," he said. U antarktičkom ledu su pronađeni planinski venci veličine Alpa, što je bacilo novo svetlo na pitanje ledenog pokrivača, čije bi čak i delimično otapanje moglo da uslovi povećavanje nivoa mora, saopštili su naučnici. Naučnici su uz pomoć radara i dubinskih senzora napravili prvu detaljnu mapu subglečerskih planina Gamburtsev, koje su otkrili ruski istraživači pre 50 godina, u srcu istočno-antarktičkog ledenog pokrivača. "Ono što je iznenađujuće je da ove planine nisu samo veličine Alpa, već i izgledaju slično kao evropski Alpi, sa oštrim vrhovima i dolinama", rekao je geofizičar iz Britanskog Antarktičkog centra, Fausto Feračoli, koji je učestvovao u istraživanju. On je rekao agenciji Rojters da bi planine verovatno bile ravne da se led formirao sporo. Ali, prisustvo oštrih vrhova nagoveštava da se led formirao brzo, "potisnuvši taj planinski predeo četiri kilometra ispod površine leda". Feračoli je rekao da su te mape "prva stranica nove knjige" o tome na koji način se ponaša ledeni pokrivač, što će omogućiti predviđanje kako će led reagovati na globalno zagrevanje. Antarktik je pod ledom oko 35 miliona godina, a leda je toliko da bi njegovo topljenje povećalo nivo svetskih mora za 57 metara. Timovi stručnjaka iz Australije, Britanije, Kanade, Kine, Nemačke, Japana i SAD, koji su takođe učestvovali u istraživanju, otkrili su uz pomoć istraživačkih podmornica vodu ispod leda. "Temperatura u našim kampovima je bila oko minus 30 stepeni Celzijusa, ali na tri kilometra ispod nas, na dnu ledenog pokrivača, videli smo tekuću vodu u dolinama", saopštio je Univerzitet Kolumbija. Poslednjih godina na Antarktiku su pronađena mnogobrojna subglečerska jezera. Geolozi smatraju da se planine veličine Alpa ili Himalaja formiraju u sudaru kontinenata. Poslednji put je Antarktik bio izložen takvim silama pre 500 miliona godina. "Ono što je ovde misterija je da su Alpi stari samo 50 do 60 miliona godina, dok ovde imamo planine te veličine koje bi mogle biti stare oko 500 miliona godina", rekao je Feračoli. Auu, kao u Planinama ludila, dragog nam HPL!!! Re: misteriozna stvorenja U PLANINAMA LUDILA! Zapanjujuće otkriće, koje zvuči poput nečega iz Žil Vernovih romana: naučnici sa Univerziteta Oksford, Univerzteta Sautemptona, Nacionalnog okeanografskog centra i Britanskog tima za praćenje Antarktika otkrili su ispod Antarktika, u oblasti Istočnoškotskog grebena, čitav “izgubljeni svet” u kome žive do sada nepoznate vrste. Kako bi istražili dubine Istočnoškotskog grebena, punog hidrotermalnih procepa, raselina dubokih i do 2,4km, u kojim temperatura dostiže i do 382 C, naučnici su upotrebili vozilo sa daljinskim upravljanjem, i otkrili su fascinantan nov svet, prepun nepoznatih oblika života. Stvorenja koja žive u hidrotermalnim procepima uglavnom su bele boje, deluju kao da nisu sa naše planete, a energiju ne dobijaju od sunca, već razlaganjem hemikalija iz vulanskog dima koje u svojoj sredini nalaze, kao što je vodonik-sulfid. O ovom mračnom i vrelom “izgubljenom svetu” u Južnom okeanu blizu Antarktika žive čitave biološke zajednice, a naučnici su bili zapanjeni tako velikim brojem nikad ranije viđenih vrsta. Pronađene su čitave kolonije jeti rakova, morskih sasa, grabljive morske zvezde sa sedam krakova i oktopodi bele boje, toliko brojni da pužu jedni preko drugih. Na svoje iznenađenje, međutim, naučnici nisu naišli na cevaste crve i školjke kakvi se obično nalaze u hidrotermalnim procepima širom sveta, što navodi na zaključak da je raznovrsnost živog sveta na ovakvim mestima mnogo veća nego što se do sada pretpostavljalo. Izveštaj o ovim izuzetnim otkrićima objavljen je u biološkom odeljku časopisa “Pablik lajbreri of sajens”, publikaciji neprofitne naučne organizacije, a zaključci do kojih naučnici u daljim ispitivanjima budu došli mogli bi da budu korisni za saznanja o postanku života na zemlji, kao i prilikom traganja za životom na drugim planetama. Nema cevastih crva i školjki?! Znam izvesnu osobu koja će ovim biti zdravo jako razočarana. Ruski naučnici već izvesno vreme na Antarktiku istražuju jezero Vostok, koje je 20 miliona godina bilo pod ledom - bez kontakta sa zemaljskim oblicima života i zagađenjem ljudskog porekla, u uslovima sličnim onima koji vladaju u podzemnim jezerima na Saturnovim i Jupiterovim mesecima, a tečnim se održava zahvaljujući geotermalnoj toploti. Sada su, međutim, bez kontakta sa spoljnim svetom ostali i sami naučnici, a njihov radio emituje samo sablasne zvuke nalik onima iz američkog horor filma “Stvar”. U uslovima koji spadaju u najsurovije na našoj planeti, ne temperaturi od oko -66 stepeni Celzijusa, istraživačka ekipa je nastojala da se bušilicama probije do jezera i izvadi uzorke za ispitivanja pre nego što se kratko polarno leto završi i temperature padnu i do -90, što se očekuje već od utorka. Sve je išlo po planu do pre pet dana, kada je radio istraživača ućutao, i od tada nemaju kontakta sa spoljnim svetom. Javnost se zabrinula, ali njihove kolege, polarni istraživači, su optimisti. Prema rečima Robin Bel, sa Univerziteta Kolumbija, koja je prošle godine i sama u sličnim uslovima posetila ovaj region, njene kolega verovatno samo pokušavaju da obave što više posla dok im vreme još ide na ruku i nemaju kad da se bave problemima sa komunikacijom. Jezero Vostok je jedno od najvećih slatkovodnih jezera na planeti, po veličini uporedivo sa kandskim jezerom Ontario, a njegovo postojanje, koje se naslućivalo još u 19. veku, potvrđeno je tek devedesetih godina, uz pomoć sonara i satelitskih snimaka. Otada tamo postoji mala istraživačka stanica i kontinuirano se radi na tome da se dopre do ovog jedinog superčistog vodenog sistema velikih razmera na planeti, uz veliku verovatniću da u njegovim drevnim vodama budu otkriveni i neki dosad potopuno nepoznati oblici života. Ми, наравно, знамо које су облике живота нашли, а они нису они из (иначе сјајног) филма СтвОр. I učinilo mi se da je jesetra, ali nisam znao da postoji i atlantska. Meni tamo u SAD nikad nisu verovali da su morune (isti rod) koje su zalazile do Kladova bile i daleko veće (6 metara). hvala, mico - ovi skenovi bi mogli da idu u NEKRONOMIKON 2.0! Lavkraft je bio vizionar, hteo je da ima maksimalno poimanje svesti o svetu koji nas okružuje i nije imao antropocentričan pristup. Jedan kritičar je napisao da je pisao o bićima koja nestaju na svetlosti, dobro pisao je i to, ali on nije bio ala Dracula. Na kraju krajeva, ovde se zna o čemu je pisao Lovecraft, neki od vas su i doktorirali na tome. About Antractica and "monsters". Po struci sam biolog koji se bavi uglavnom teorijskim proučavanjem sastava živih organizama kao najoptimalniji odgovor na uslove sredine u kojima žive. Antarktik je u geološkoj istoriji Zemlje imao i tropskih trenutaka, pa eto i prilike da tamošnji živi svet diverzifikuje a i da poradi na sopstvenom gigantizmu, jer se tamo živelo u izuzetno kompleksnim lancima ishrane gde je jako bilo bitno ko je veći. Svakog vizionara, zabezeknut pred ogromnim skeletom ili hitinskim omotačem, bi takve stvari navele da svoju fabulu smesti tamo, kao što je i Lovecraft uradio, smestivši svoje prvence tamo gde su imali vrhunac svog civilizacijskog razvoja (malo antropocentričan pristup) i koristivši neku organsku, ameboidnu stvar kao svoje robove koji su se pobunili protiv njih (ovaj deo je Lovecraft malo konfuzno objasnio) i uništili ih. Ja volim da upoređujem Lavkraftovu maštu sa prirodom univerzuma koji razumemo kroz živi, neživi svet sa svom tom fizikom i hemijom u njemu, ali sve nauke trebaju da ostave lufta kada je u pitanju dark matter. Kao što sam nebrojeno puta tvrdio, ljudsko poimanje, čak i pomoću najpreciznijih fancy instrumenata, ne može da u potpunosti sagleda ovaj svet, prvo prostorno, jer smo istražili nekih 0,00000000000000...00001% svemira i to onako na grubo, iz daljine, jer se još uvek krećemo ogromnim količinama energije kojom se prelati veoma mala daljina, a drugo, tamna materija koegzistira na istom prostoru i sa vidljivom materijom, jer ona je skup drugih frekvencija koje mi i naša tehnika ne može opaziti, tako da Lavkraftov sistem shvatam kao jednu moguću soluciju da sagledamo dark matter. Na kraju krajeva, moramo da, dok ne budemo zbrisani novim trendovima evolucije života, otkriti šta će nam toliki intelekt koji još možemo da usložnjavamo a koristimo ga samo nekih 10%, o čemu se spekuliše. Nisam kreacionista, pomisao na kreacionizam me stavlja u položaj ekstremnog agnostika, nisam baš ni ekstremna pristalica da je život nastao u Oparinovoj koacervatnoj kapi, ali neke stvari su definitivno posejane na Zemlji, toliko bombardovanja asteroidima je preživeo taj maleni užareni fragment Sunca koji se polako hladio, da sad mi tu budemo ekstremni u jednoj soluciji i gotovo. Sve u svemu, ložim se na Lavkrafta, koji je imao želju da istražuje, da izučava ono čega se plaši a ne da beži od toga u nekoj ružičastoj svakodnevnici, u njegovim delima fakulteti rade na izučavanju sveta (na našim se rade doktorati do pred penziju i posao na fakultetu ima za cilja da se ljudi uglavnom samo kurče)..Sve drugo reći je suvišno. Možete me naći na Fb, ali su moje tamošnje izjave samo ironična amortizacija na udarne rupe koju ogroman humanoidni svet šalje kroz tu globalnu kanalizacionu mrežu. Zato je i zovem Fecesbook. 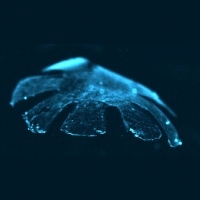 A jellyfish made of silicone and rat heart cells 'swims' in water when subjected to an electric field. Janna Nawroth, a graduate student at Caltech who performed most of the experiments, began by mapping every cell in the bodies of juvenile moon jellies (Aurelia aurita) to understand how they swim. A moon jelly's bell consists of a single layer of muscle, with fibres that are tightly aligned around a central ring and along eight spokes. Form and function Nawroth created a structure with the same properties by growing a single layer of rat heart muscle on a patterned sheet of polydimethylsiloxane. When an electric field is applied across the structure, the muscle contracts rapidly, compressing the medusoid and mimicking a jellyfish’s power stroke. The elastic silicone then pulls the medusoid back to its original flat shape, ready for the next stroke. Gomila organske materije, it isn't actually alive. Ima u komentarima na članak rasprava o tome. Nije, naravno, u pitanju živo biće u fullu - ne jede, ne razmnožava se - ali jeste od živih ćelija. Kao kad izvadiš nečiji organ kada ga pripremaš za transplantaciju i održavaš ga živim do ubacivanja u novog domaćina - on jeste živ iako nije ful metal živo biće. For those not familiar with the CV of mining billionaire Clive Palmer, you could be forgiven for thinking this sounds a bit out there, but sources close to the man himself are reporting that Palmer wants to clone a dinosaur from DNA and release it in his resort in Coolum, Queensland. Welcome…to Jurassic Palmer. Now remember that this is all coming from “a source close to Palmer” so it might all be bunk, but this is the man who wants to rebuild the Titanic. I’d believe anything at this point. If it is true, though, we could have a major incident on our hands. Cloning dinosaurs all starts with “ooh” and “aah”, but then it always ends with running and screaming, as we know far too well. Life finds a way. Russian researchers pose for a picture after reaching the subglacial Lake Vostok in Antarctica on February 5, 2012. Russian scientists believe they have found a wholly new type of bacteria in the mysterious subglacial Lake Vostok in Antarctica. Russian scientists believe they have found a wholly new type of bacteria in the mysterious subglacial Lake Vostok in Antarctica, the RIA Novosti news agency reported on Thursday. The samples obtained from the underground lake in May 2012 contained a bacteria which bore no resemblance to existing types, said Sergei Bulat of the genetics laboratory at the Saint Petersburg Institute of Nuclear Physics. "After putting aside all possible elements of contamination, DNA was found that did not coincide with any of the well-known types in the global database," he said. "We are calling this life form unclassified and unidentified," he added. The discovery comes from samples collected in an expedition in 2012 where a Russian team drilled down to the surface of Lake Vostok, which is believed to have been covered by ice for more than a million years but has kept its liquid state. Lake Vostok is the largest subglacial lake in Antarctica and scientists have long wanted to study its eco-system. The Russian team last year drilled almost four kilometres (2.34 miles) to reach the lake and take the samples. Bulat said that the interest surrounded one particular form of bacteria whose DNA was less than 86 percent similar to previously existing forms. "In terms of work with DNA this is basically zero. A level of 90 percent usually means that the organism is unknown." He said it was not even possible to find the genetic descendants of the bacteria. "If this had been found on Mars everyone would have undoubtedly said there is life on Mars. But this is bacteria from Earth." For the second time in recent months, a giant sea creature has washed ashore in California. First it was a rare oarfish that had grown to a freakish 100-foot length. This time it was a giant squid measuring a whopping 160 feet from head to tentacle tip. Are giant sea creatures really a threat for those on land? “Take Jaws but make him the size of a Manhattan skyscraper,” said Bruce Kenner, a marine biologist at UC San Diego. Kenner thinks that gigantism might distort sea creatures' navigational systems. “If that guy took a wrong turn onto the coastline he could level 40 city blocks thrashing before he comes to rest,” he said. PS: da, ovo je sa 'satiričnog' sajta! Visok holesterol je najbolji dokaz da smo životinje. Životinja koja je 93% holesterol, to mi zvuči kao nešto što bi moj otac u slast pojeo. S takvima mora da budeš oprezan.